This former coaching inn is the biggest example of the quirky architectural style established in Marford in the early 19th century. The window apertures of the main building have unusually shaped tops, known as ogee heads. The windows themselves are divided into numerous panes by ornate iron frames. The former stable block, behind the car park, has an upper row of windows shaped like eyes. You can see similar features in the village’s older houses. The inn was in the original group of buildings which featured this unusual style, in the first decade of the 19th century. The whimsical features probably sprang from the imagination of one or more of the craftsmen at the Trevalyn Hall estate, which included Marford. The Trevor family owned the estate but never lived at the hall. The Trevor Arms incorporates a much earlier building. Some of the beams appear to be from the 17th or early 18th century. The thickness of one of the internal walls indicates that it was originally an external wall. For 35 years, Daniel Dudleston was landlord of the Trevor Arms Hotel. 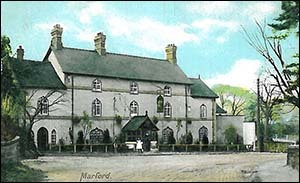 He died aged 79 in 1903, when the press reported that he had made Marford “the favourite resort it now is for tourists”. It was a popular destination for church outings and other groups from Liverpool and the Wirral. In 1902, for example, workers from the Lever Brothers soap factory at Port Sunlight took part in a programme of “athletic sports” at the inn. The Trevor Arms was the favourite pub of RAF pilot Ken Rees, whose “bachelor party” started here in October 1942, on the eve of his wedding. Later that month his bomber was shot down over Norway. Imprisoned at Stalag Luft III, he helped to dig the tunnel immortalised in the film The Great Escape. After the war he ran Bangor-on-Dee post office and a club on Anglesey. Behind the pub is a former sand and gravel quarry which supplied materials for the Mersey Tunnels. It’s now a Site of Special Scientific Interest. It’s home to orchids and other rare plants, and to many types of insects including butterflies and a type of wasp which eats spiders! It’s said that the Trevor Arms is haunted by the ghosts of a Cavalier killed nearby during the Civil War and of the wife of a Trevalyn Hall estate steward, who reputedly threw her down the stairs to her death while he was having an adulterous affair.